King County’s 2009 estimated population is 1,909,300—that’s about three and a half Seattle’s, and 29 percent of the State’s total population. The County produces just under half of the State’s total industry earnings. It covers nearly twice the land area of the State of Rhode Island, and encompasses six watersheds, the State’s second largest lake, part of a major mountain range, and extensive marine coastline. King County is known for being a liberal hotbed, but political viewpoints range widely. In particular, many residents of the rural parts of the County believe that County government tends to be too dominated by the interests of Seattle and its nearby suburbs—a sentiment that has led to two intiatives to split the County. The County’s Critical Areas Ordinance (CAO) is the poster child for the tension between urban and rural King County. Rural landowners perceive it as unfairly onerous regulation imposed by urbanites who don’t understand or appreciate the rural way of life. Environmental interest groups—most of which are based in Seattle—believe the CAO is essential for fostering the long-term ecological health of the region. And Dow Constantine has taken plenty of heat for his involvement with the CAO, even though he led the effort to modify Ron Sims’ original proposal in response to the concerns of rural landowners. King County also has a massively consequential impact on the region through its operation of Metro Transit, which, based on 2009 ridership stats, is the eighth largest public transit system in the nation. Metro buses are the workhorses that have enabled Seattle to achieve a remarkably high transit commute mode share of 18 percent. And even as we build more light rail, Metro buses will continue to be the County’s transit workhorses for a long time to come, and as such will be a critical factor in reducing car dependence as the region grows. All in all, King County embodies the full spectrum of challenges to achieving a sustainable future at the regional scale: the yin-yang of urban and rural. Our cities cannot become sustainable in a vacuum—they affect, and are affected by the surrounding region. And therein lies the importance of a visionary King County government, and the great potential for progress with a guy like Constantine at the helm. The County has been making forward-thinking moves on many fronts in recent years, including sustainability indicators, green building, transfer of development rights, and perhaps most notably, the nation’s first legislation aimed at regulating the greenhouse gas emissions associated with development. And the time is ripe for Dow Constantine boldly push such programs further, and also be bold about new policy that will tap latent sustainability synergies in the County’s diverse people and places. For example, how about a program that includes greenhouse gas emissions in the transfer of development rights equation? The hope of the city lies outside itself. Focus your attention on the cities—in which more than half of us live—and the future is dismal. But lay aside the magnifying glass which reveals, for example, the hopelessness of Broadway and Forty-second Street, take up a reducing glass and look at the entire region in which New York lies. The city falls into focus. Forests in the hill-counties, water-power in the mid-state valleys, farmland in Connecticut, cranberry bogs in New Jersey, enter the picture. To think of all these acres as merely tributary to New York, to trace and strengthen the lines of the web in which the spider-city sits unchallenged, is again to miss the clue. But to think of the region as a whole and the city merely as one of its parts—that may hold promise. Posted by dan bertolet on	Monday, November 9th, 2009 at 8:52 am. You can follow any responses to this entry through the RSS 2.0 feed. You can leave a response, or trackback from your own site. Agreed. But as a former King County person myself I regret to say that the road for Dow is quite steep and the real question is where does he want to go next. It is likely or possible that our esteemed Governor will not seek another term in 2012. If that is a case Dow is at once a contender. That means he will need labor support which has consequences for the things you suggest. The fact is that the Growth Management Act in effect mandates, if it is followed, that King County Government get smaller and more focused on the kind of excellent ideas you propose. However, it has thousands of union employees who have had powerful sway over Ron Sims. They want the jobs. But the fact is that the tax base is disappearing as cities are formed and annex unincorporated areas. So the question, as always, will Dow endeavor to do the right thing, shrink county government and focus on ideas like the one you mention at the expense of being the Governor of Washington? I am buying front row seats to that show. I doubt that Dow will lose the significant union support in a race for governor even if he does the right thing vis-a-vis shrinking the county. The governor’s race is still partisan. What is labor going to do, endorse the republican during Barack Obama’s reelection year? As far as winning the primary is concerned, Dow’s name recognition, support from the environmental community and other liberal interests in King County should be more than enough to put him over the top, and in the general election Dow would likely gain more rural votes in Eastern Washington using the “I cut the size of King County Government by 30% in three years” line than he will lose in the West. By the way, Mike McGinn did not have the support of labor or business, and he managed to pull off an upset in the most liberal, pro-labor places in the state. The question is not whether Dow needs to bend over for labor to be governor, because he doesn’t. The question is whether Dow THINKS that he has to bend over for labor to be governor. Only if he holds that mistaken impression does Roger’s dilemma of right thing vs. winning take hold. All Dow has to do is realize that there is no conflict and that the best way for him to win IS to do the right thing, and the problem goes away. I am with you Tony! 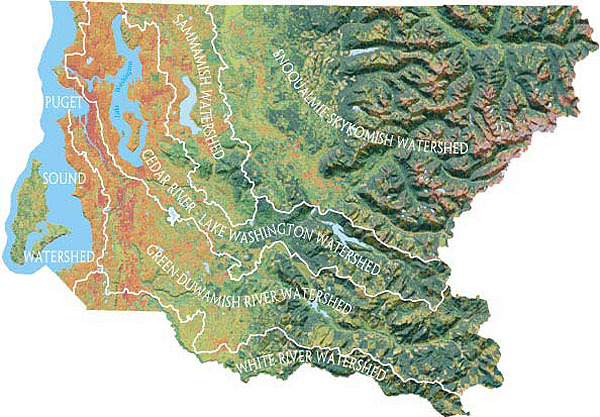 Cool maps (especially the watershed map) what are they (I want to get them)? With regards to Dow, much of his success will be based not only on how he manages his team and the competing interests, but on how he reaches out to the other Washington and gets us some much needed cash. The county, like almost all regions in the country, is hurting for money (we can’t print our own, like the feds). We got some via the first stimulus, but not enough (for the country or the county). There will probably be another one, and how successful Mr. Constantine is in getting us our share of the money (and having it be for useful projects) may determine his success. For example, we could do really well just buying a bunch of buses. I noticed that General Motors makes those big, articulated hybrid buses that Metro uses. If we cut down on the number of runs (a sad possibility, given the budget situation) than it would be really nice to have every bus be a new, big articulated bus (as each bus will be crowded). That will likely mean a lot of buses sitting idle, or, better yet, a lot of buses being sold to the few districts that have money. It seems to me that just giving a bunch of new buses to areas across the country would be a big win for the bus makers as well as the bus riders. And it is likely pure political fantasy to think that Olympia is going to give more taxing authority to King County. So, again, we’re back to Tony’s point. With regards to the budget, most of the cuts would be very painful to the unions and all involved. I don’t see union involvement in that as an issue at all. The one possible exception is in criminal justice system. I believe that this is the area where most of the cuts will come from. I think the country (and certainly the county) is willing to re-think the whole “war on crime” and certainly the “war on drugs” strategy. Former Texas Governor Mark White was on Tavis Smiley yesterday talking about this very thing. Not only has White come around on the death penalty issue (which was the focus of the interview) but he said very clearly that he wanted to change our incarceration policies. Even though he is a Democrat, for any Texas politician to say that sort of thing is rather interesting. It may be a sign that things are changing in this country (simply locking up every stoner doesn’t make sense). This is where the unions could make a fuss. However, this isn’t California. The prison guard union in this state doesn’t have much power. If they try to get it now, it will be seen (rightly so) as an attempt to further their own interest, and not the interest of the county. With the county being unable to raise taxes, I just don’t see the unions having much influence this session. If we could raise taxes, then I could see them getting involved (in the battle involving those favoring tax cuts versus those wanting more services). I’m a little disturbed by Dan’s use of the term Yin-Yang as somehow an applicable description of urban-rural lifestyles and concerns. The term Yin-Yang does not indicate an understanding of the progressive planning philosophy of New Urbanism nor its advancement, sometimes called Regionalism. 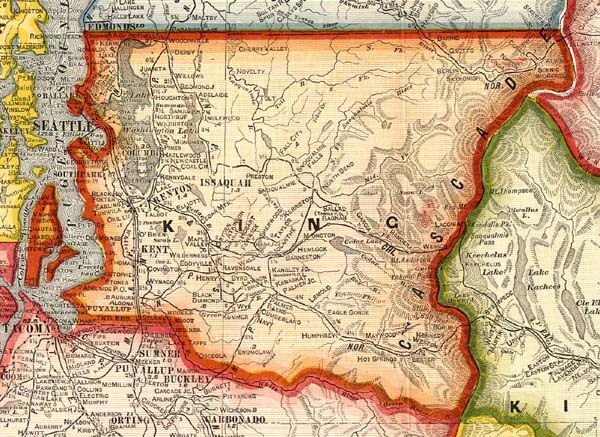 Regionalism generally encompasses metropolitan area ‘regions’ and as such its advocates and overseers are within the authority of Puget Sound Regional Council (PSRC). I am always irked by activists who hold the opinion that urban areas must intensely densify while suburban and rural areas must depopulate and restore habitat and ecosystems. This is NOT New Urbanism NOR Regionalism. I could elaborate, but it’s also telling that this discussion devolved into a political assumption about a Constantine bid for Governor in 2012. You can spend hours in the map room at UW Suzzallo Library. Ever seen a atlas with Tannu Tuva in it? Where did you get three and a half? I understand seattle’s population is 602K, which means the county is about 3.1x the population. I was suggested this web site via my cousin. I’m not certain whether or not this post is written by him as nobody else recognise such precise about my problem. You are wonderful! Thanks!